Book(s): The Sonrisas curriculum has been chosen for this age group. You will not need to purchase any books for this class. Book(s): Realidades (2004) ISBN 0131016873; Realidades Workbook ISBN 0130360074. For registered students, we have a few extra copies of this book at hand for $15 for both books if anyone is interested or you can purchase these books new or used online through AbeBooks.com, half.com, Amazon.com, etc. Please make sure the ISBN numbers match. Also, be careful not to purchase the teacher's edition. Book(s): Expresate! Spanish 1 (2008) ISBN 978-0-03-045204-8; Expresate! Cuaderno de vocabulario y gramatica ISBN 0030744962. You can purchase this books new or used online through AbeBooks.com, half.com, Amazon.com, etc. Please make sure the ISBN numbers match. Also, be careful not to purchase the teacher's edition. Book(s): Expresate Spanish 2 (2008) ISBN 978-0-03-045322-9; Expresate! Cuaderno de vocabulario y gramatica ISBN 0030744970. You can purchase this books new or used online through AbeBooks.com, half.com, Amazon.com, etc. Please make sure the ISBN numbers match. Also, be careful not to purchase the teacher's edition. This class would be a gentle introduction to Spanish. The class would not be completely conducted in Spanish because we believe that it would be too stressful for some children to comprehend, but as the class grows in understanding our teacher would speak to them more and more in Spanish. When speaking to the children in Spanish, a limited vocabulary will be used and strive (by actions, pictures, or words) to make sure the children understand the meaning. Songs and simple pieces of literature will be utilized to expose the students to authentic language. Lots of games will also be played. Initially the teacher will be the one talking the most; the students will be asked to show understanding non-verbally at first. After four or five months, the children will be encouraged to speak in Spanish, first words, then short sentences. If young students are given enough time to listen to the language, they will develop a better ear for the sounds and have a better accent later. At this level, since some students may still be learning to read in English and to avoid confusion, written language will be limited. The curriculum that is currently being taught includes lots of comprehensive input, covers common topics (the family, pets, the weather, etc. ), and is lots of FUN for the students. Students who enjoy learning Spanish now will later look forward to it when they take up a more academic pursuit of the language. A middle school textbook with a lot of added activities will be used for this course including the following: music, drama, and games. If students are enjoying spending time in a particular topic, the class will not be hurried through that chapter. Students will be expected to participate as a group, and later as confidence grows, as individuals. Students will have about two hours of homework during the week, which would include listening to Spanish files, memorizing vocabulary, and doing practice exercises from the textbook and workbook. There will be some grammar involved but the focus of the class will be everyday communication. Home quizzes will be send on a regular basis for the students to do at home and be returned at a timely manner per request. Homework will be evaluated and quizzes will be graded. Access to the internet to listen to the audio files and to use Quizlet for vocabulary is recommended and ideal. If internet access is not available, alternate arrangements can be made. This class will be a traditional Spanish class, including grammar, speaking, listening, and composition. In class students would be expected to participate in music, drama, games and oral exercises. Students will concentrate on doing certain activities in class that they cannot do at home alone. At home, students will have about four hours of homework during the week, including audio files, memorizing vocabulary, and doing practice exercises from a textbook and workbook. Students will be graded on completion of homework, participation in class, and quizzes and tests. Students will be given a precise schedule as well as feedback on their homework each week. In addition, our Spanish teacher will be available via telephone during certain hours of the week to work individually on pronunciation and to answer any questions. Internet access will be necessary to access essential audio files and Quizlet, and possibly Quia. This class will be a traditional Spanish class, including grammar, speaking, listening, and composition. In class students would be expected to participate in music, drama, games and oral exercises. Students will concentrate on doing certain activities in class that they cannot do at home alone. At home, students will have about four hours of homework during the week, including audio files, memorizing vocabulary, and doing practice exercises from a textbook and workbook. Students will be graded on completion of homework, participation in class, and quizzes and tests. Students will be given a precise schedule as well as feedback on their homework each week. 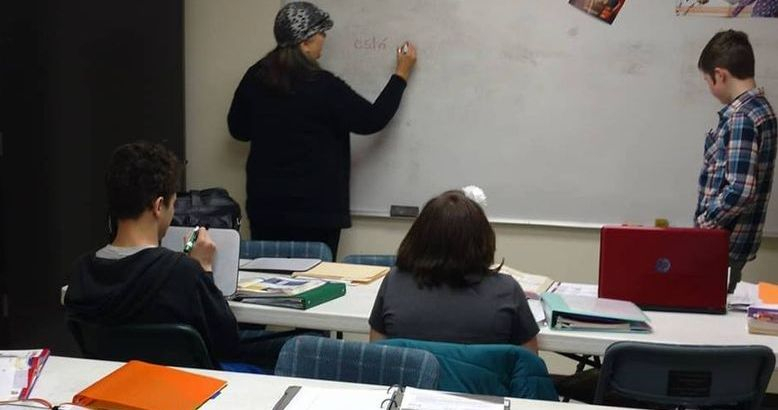 In addition, our Spanish teacher will be available via telephone during certain hours of the week to work individually on pronunciation and to answer any questions. Internet access will be necessary to access essential audio files and Quizlet, and possibly Quia. Spanish 2 is a continuation of the previous year with more focus and emphasis on all the above as well as conversation for a better comprehension and communication skills of the language.